The following is a list of the oldest players to ever play in the NBA. A total of ​24 players have played in the league who were 40 years or older. Listed here are the ten oldest players in NBA history. One of these players is thought to be much older than his listed years and he looked and played like he was a lot older than his listed age to me and it is possible he is the oldest player all-time but not officially. Nat Hickey was the coach of the Providence Steamrollers in 1947-48 in the old BAA the predecessor of the NBA. Providence was an awful team and would finish the season with a 6-42 record. On January 28, 1948, just two days shy of his 46th birthday Nat Hickey figured he had nothing to lose and put himself in a game. He was awful missing all 6 shots he took and he committed 5 personal fouls but he did make 2 of the 3 free throws he attempted. After sitting out the entire 2005-06 season 44 year old Kevin Willis tried to make a comeback with the Dallas Mavericks in 2006-07. The comeback lasted just 5 games but it was enough to make Willis the second oldest player to ever play in the NBA. Willis played in the NBA for 21 years and is 5th all-time in games played having played in 1,424 games. Robert Parish also played in the NBA for 21 seasons and is the all-time leader in games played with 1,611. The Chief, who won 3 NBA Championships with the Boston Celtics, went out the right way. He played his last season in 1996-97 with the Chicago Bulls and won his 4th NBA Championship. He played sparingly all season and appeared in just 2 playoff games but winning that 4th ring must have been a nice way to finish his hall of fame career. Foreign born players often have sketchy birth records and many of them will claim to be younger than they are. 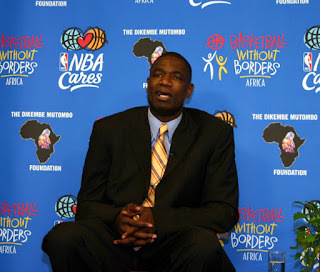 Dikembe Mutombo played in the NBA for 18 seasons, earning $144 million in salary, and he officially retired in 2009 at the age of 42 but many suspect he was much older. Kareem Abdul-Jabbar played in the NBA for 20 seasons and played his last game when he was 6 days past his 42nd birthday. Kareem is the all-time leader in points scored and is 2nd all-time in games played having played in 51 games less than Robert Parish. Bob Cousy played for 13 years with the Boston Celtics and retired in 1963 at age 35. He went on to become the head coach of the Cincinnati Royals in 1969-70. The Royals were not a good team that year and they didn't draw well so Cousy put himself into 7 games at the end of the season as a 41 year old. He played lousy as one would expect scoring just 5 points and handing out just 10 assists in 34 minutes played but attendance did pick up. Herb Williams was always known as a good guy to have in the locker room and that helped his career last until he was over 41 years of age. John Stockton is the all-time leader in both assists and steals and played in the NBA for 19 years. He was 40 years old through most of his last season in 2002-03 and was still a productive player as he started all 82 games and averaged 10.8 points and 7.7 assists per game. Charles Jones didn't start playing in the NBA until he was 26 years old. He lasted for 15 years, though, and retired at age 41. Jones was strictly a back-up in his career and lasted mainly due to his shot blocking and rebounding ability. He averaged 4.7 points, 8.3 rebounds and 2.9 blocks per 36 minutes played. He won a championship with the Houston Rockets in 1995. The Mailman kept mailing it in until he was almost 41 years old. Malone joined the Utah Jazz in 1985-86 one year after John Stockton got there. They played together for 18 seasons and then Stockton retired and Malone played one more season trying to win a championship with the Los Angeles Lakers in 2003-04. Steve Nash played with the Lakers in 2014 at the age of 40 years and 60 days. In his last year in the NBA in 2002-03 with the Washington Wizards, Michael Jordan averaged 20.0 points per game as he turned 40 years old that season. A great average for almost anyone but Michael Jordan. MJ was just human that season instead of super-human. Jason Kidd retired after the 2013 season at the age of 40 years and 56 days. Kidd is second all-time in NBA history in assists and steals. Currently the head coach of the Milwaukee Bucks, it's possible Kidd activates himself and plays in another game at some point in the next few years.